The hunt for a nice and cosy dessert joint is always a pleasure. 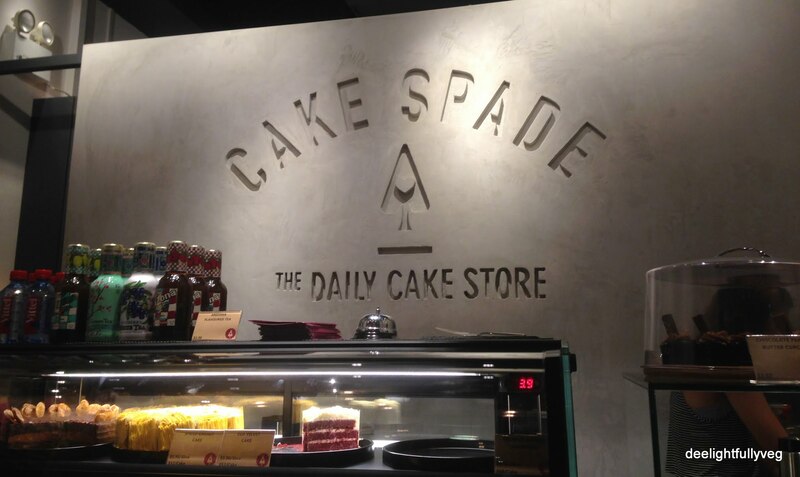 During one such outing, I ended up at Cake Spade situated near the Orchid Hotel in Tanjong Pagar. This place stands out in a neighbourhood filled with ramen and burger joints. The first thing that made me venture into the shop was the tempting display of cakes. The place also has an interesting logo which reminded me of a pack of cards. Even though the place does not have more then five to six tables, it is packed with people. On a weekend evening, you might have to wait for some time for a table. The price list is clearly mentioned on the wall. If you are confused on what to order, the service people at the counter are nice enough to suggest items to your taste. 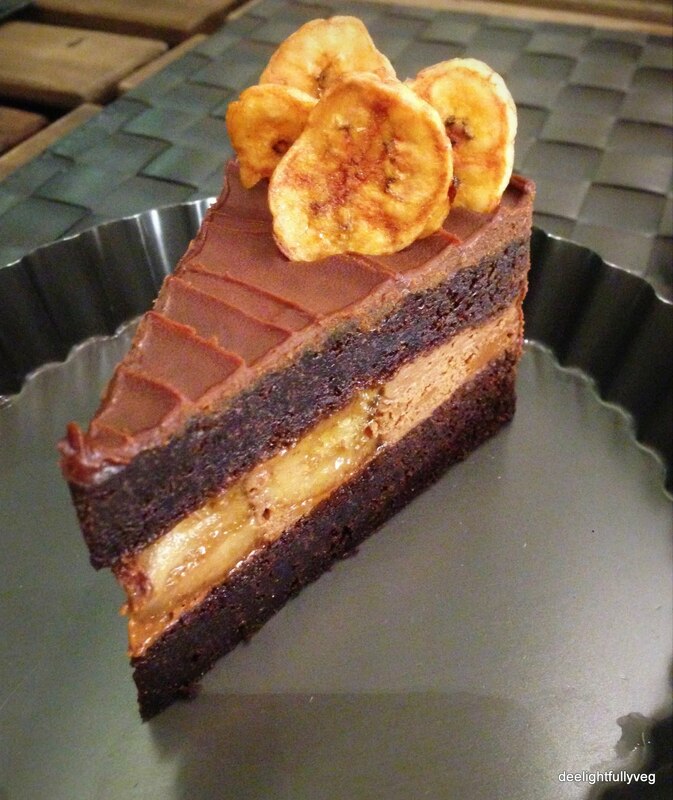 We first ordered the ‘Dark Chocolate Banana Cake’ which had banana wafers attached to it on the top. Its amazing how much visual appeal matters with respect to food – specially desserts. The cake was rich in texture and quite tasty. The chocolate layer was moist and enhanced the taste. I had never heard of tofu being used in a cake. So I decided to try the ‘Peach Tofu Cheesecake’ which had a tempting dark yellow colour. 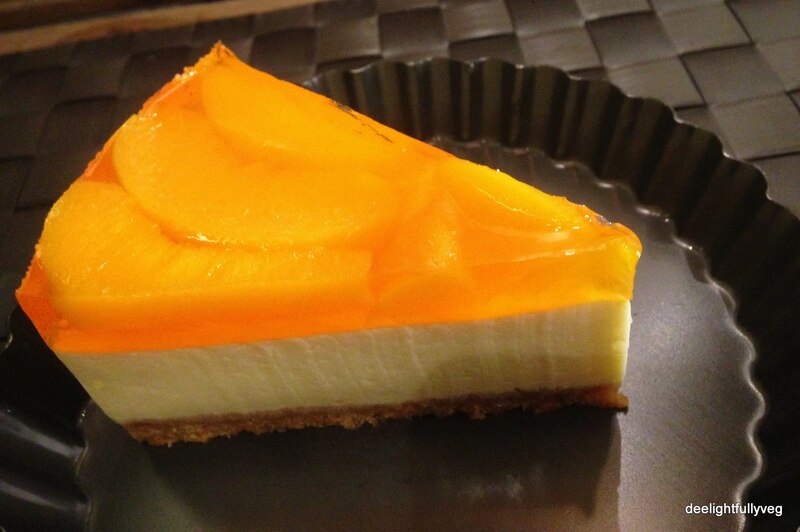 The peaches enclosed in the top jelly layer looked attractive and could be tasted clearly. There is a digestive biscuit crust at the bottom with the cheese layer in between. I am generally OK with mild cheese in my cheesecakes and so I enjoyed this cake. This cake is also available with a strawberry filling. If you are hanging out in the area and are on the lookout for decent desserts, then Cake Spade is worth a try. Posted on July 26, 2014 by deelightfullyveg	• This entry was posted in Restaurants and tagged Cheesecakes, Desserts, Tanjong Pagar. Bookmark the permalink.